When Sallie and Welling Clark drove down the residential street of historic homes in Colorado Springs and spotted the dilapated Victorian, history was made. Today, the stately Victorian and its partner homes, becons guests to manicured lawns, inviting verandahs with freshly painted porch swings, white wicker and lazy rocking chairs, a Shakespeare garden reminiscent of Anne Hathaway’s cottage in Stratford on Avon, England – and a secret garden with fountains and a gazebo. A far cry from the former weed infested yard, broken concrete sidewalks and crumbling house foundation the Clarks first saw in 1985, years of painstaking work has paid off. The transformation of the main house, adjacent carriage house and lovely Rose Victorian house next door, has made a picture perfect cluster inn. And, the most amazing part is that Sallie and Welling Clark are still operating the inn as their own, 23 years later – an anomaly in an industry which averages 5-7 years for B&B innkeeper longevity. What makes Holden House such a success? “When you have a love for your home, your community and art of hospitality, it’s inherent to share that with others”, says Sallie. “What else would we do? It’s hard to say, because I can’t think of anything else at this point.” And although the Clark’s both work other jobs – Sallie an El Paso County, Colorado, Commissioner and Welling a Research Scientist for ITT, both are still intimately involved in the inn along with their capable and friendly assistant innkeepers who provide daily guest service with a smile, friendly attitude and attention to detail. It was a chilly February day in 1985 as we drove down the quiet residential street near Old Colorado City. We were looking to view our next on a long list of “For Sale” homes, suitable for our bed and breakfast. Suddenly, our real estate agent called out, “Did you see that house back there?” Little did we know that the house she had just spotted would be the topic of conversation for years to come. There was no for sale out front and it wasn’t listed in the real estate guides. There was, however, a sign in the front window indicating it was a HUD repossession home. It was apparent that the avocado green house was a once beautiful turreted Colonial Revival Victorian. Although years of neglect had allowed the weeds to grow, untamed and unkempt, standing in some cases, four to five feet tall, it seemed to have the qualities we had looked so long and hard to find. It was just the character we wanted for our future home and bed and breakfast inn. It was a matter of love at first sight and a house that was crying out for help. When we went back the next day, the lock box wouldn’t work. As luck would have it, a slight nudge on a porch window, opened the world to us and to making our dream come true. As we climbed through the window, the openness of the living room, unusual for a Victorian and the formal dining room with the gold foil wallpaper caught my eye. Despite the rust shag carpet with matching drapes, the Colonial wallpaper in dated 70’s colors and the unsuitable Franklin stove, sitting on fake brick-looking base somehow did not deter the house’s appeal. Ever since Welling and I traveled B&Bs throughout California in our early years of marriage, we had vowed to leave the Southern California area to create our own dream, a Victorian Bed and Breakfast in Colorado. The many summers I’d spent on my grandmother’s farm in Pueblo and our mutual love for the state, particularly special since we honeymooned there, Colorado had been calling. Welling’s long absences through his job as a Naval officer and my job in the cancer treatment field, had tempted us to look for other professions. The idea was that the bed and breakfast would serve as one source of income and Welling would work outside the home. As luck would have it, I found the house, and Welling received a job offer on the same day! Of course, I can still remember our parent’s reaction, thinking we had lost our minds when they first saw photo of our “Dream House”. We then discovered the house had been vacant for nearly four years, was previously used as four apartments and was currently in bankruptcy with HUD. Last but not least, it was in the first stages of being condemned by the City. After some historical research, I then determined that the home had been built in 1902 by Mrs. Isabel Holden, the widow of a prominent Colorado Springs businessman and mother of six children. In 1900, Mrs. Holden purchased the property at 1102 W. Washington Avenue (later changed to 1102 W. Pikes Peak Avenue) for $1,000. She then proceeded to build the home our guests now recognize as Holden House-1902. Then, the realtor informed us that house was currently under contract with another buyer, so we put in a back up offer, just in case the first deal fell through. The first glance reasonable price of $65,000 seemed a great deal since we figured it would allow us to purchase the home and renovate it to our satisfaction. How much money this would cost, we had no idea. Today, Welling still calls it “The Money Pit” after the popular Tom Hanks movie. When the other offer fell through (we later learned that this particular home had fallen through for contract eight times previously), we were next in line for the purchase. The first step was to perform an engineering inspection and we were quite “enlightened” by the engineer’s findings. The house required new plumbing, heating, wiring and as an added surprise, a totally new foundation.! Even after reading the report, Welling and I still decided we wanted to purchase the house, so we proceeded to obtain financing. Now, we expected that banks would be helpful to lend on a stately Victorian house with so much potential. I guess “potential” wasn’t in their pro-forma plan. After several long months of attempting to obtain financing, one bank finally provided us with a temporary construction loan. Then, the city’s Community Development division stepped in to assist with securing renovation loans. After the project was completed, the home was re- financed. At this point, we thought our troubles were over, but little did we know, they were just beginning. Welling had started his new job with Kaman Sciences Corp. and I was still living in California, attempting to sell our house there. Community Development located a contractor for the work and although they had our best interests in mind, the contractor we hired was not all it was cracked up to be. The contractor finally began work in August of 1985. After many long days of waiting, the day appeared when the house movers were to lift the house. We watched with trepidation and anticipation as the house was slowly jacked up on enormous steel beams. It was not a calming experience, I can assure you, but once the house was on its temporary foundation of beams and railroad ties, we all felt a sigh of relief. Our nearby neighbors gave us a lot of moral support, despite the stressful situation. It seemed then, as if we waited forever for the foundation work to be completed. The subcontractor did not show up on time, so our contractors ended up setting the forms and pouring the foundation themselves. The workmanship left a lot to be desired, but we were so happy to see it finished, and it finally passed inspection. Three months after the house had been lifted, it was finally placed back on its brand new foundation. I can still remember the house mover’s humorous (at least to him) remark regarding the jacking up of the house. He said, “Don’t worry, the second time is free!” If that was supposed to have made us feel better, it didn’t. Now, except for a few minor stress cracks inside and the porch temporarily separating from the rest of the house, all was intact. Whew! The inside work was now to begin. When we chose a few different plumbing fixtures, the prices began to escalate. This was only the start. Believe it when you’re told to double your original contract price and double the time it will take to complete the project! With an old house, one expects extra problems and well, we certainly had our share of those, and more. Our contractors had just started to do some interior dry walling and on Christmas Eve, the gas company decided our meter was too low to the ground and came to shut off the gas and remove the meter. Seems they’d left their Christmas spirit at home that day! We made some quick maneuvers and the gas company agreed to install a temporary meter while we had a new gas line installed. Chalk one up for more of the green stuff! We saved a lot of money by doing most of the cosmetic finish work ourselves, but I wouldn’t recommend it if you don’t enjoy that sort of work. Working on an old house can ruin a marriage very quickly. Welling and I spent many long hours sanding and scraping all the interior house trim and molding before we painted (the previous owner had installed acoustical ceilings and didn’t remove the residue from the trim before painting over it). We removed all the doors and sent them out to be professionally stripped. I stripped the banisters by hand and carefully refinished the banisters and doors. This was a triumph for me as refinishing is my least favorite job. One would think that one of the first priorities should be to make the heating system operable during winter in a cold climate. It didn’t seem to work that way with our contractors. It was certainly no pleasure sanding and working in a house that was nearly at freezing at times. We had to wear layers of sweatshirts, long underwear, moon boots and gloves just to work for short periods of time. The small space heaters we used hardly helped at all. Not only were our paint and brushes occasionally frozen, but so were we. The contractor had not planned ahead for the heating system and it was late December before we finally had a heated house. Next came the water system. When our water was finally connected and turned on, we had no water pressure. The water lines to the house were so old and corroded (to approximately the size of a pencil) that our entire waterline to the street had to be replaced. We also discovered that our old clay sewer pipes were ridden with tree roots! Another unplanned expense! Months after the plumbing contractor had finished the water and sewer lines, we discovered five-foot deep sinkholes where the soil had not been properly compacted. We filled the holes, but still found this a problem years later, requiring a mudjacking job several years ago to keep our driveway from sinking. One of the final improvements to be made before we opened for business was the installation of an automatic sprinkler system. Welling and his father had to dig in our clay soil, which when dry, resembles cement. They picked out most of the soil by hand and used a ride trencher for the larger areas. They also discovered an unknown sidewalk on the Westside of the house that had been covered up by three foot of dirt after our foundation was completed. The sprinklers were finally finished and sod was installed. It has been a time and lifesaver for our now lovely lawn and garden. The kitchen was completely gutted out and remodeled with modern appliances, concealed behind knotty pine cabinets. This was done to keep the “old house” feeling. It was an expensive, but necessary endeavor for me, considering how much I cook. Just last year, we refreshed the kitchen with new granite counters, appliances and flooring and updated our main floor bath off the kitchen by re-using our original clawfoot tub and adding beadboard, wainscot and wallpaper that resembles a tin ceiling. The guest rooms each have a gorgeous private bath with Roman and soaking tubs for two, fireplace and upscale amenities. Each suite is named for the towns in which the Holden’s owned mining interests. The Aspen suite boasts an open turret with a skylight and a bathroom equipped with a luxurious 80 gallon soaking “tub for two”. Perfect for honeymooners or romantics at heart! Our many additional improvements have included new sidewalks and driveway, interior painting, wallpaper and decoration, the installation of an antique iron fence, a new electrical breaker box and a Victorian garden. Before we repainted for the second time, we also replaced a large amount of clapboard siding. Using masonite pre-primed 8″ boards and ripped them in half to match the existing siding. This saved us a lot of money as opposed to cedar and looks identical to the original, now that it’s painted. It’s a great alternative to “vinyl” or “aluminum” siding which reduces the value of the original look. Our vibrant “Painted Lady” colors are now the talk of the neighborhood. In addition to adding central air a few years ago, our eventual plans include replacing the wood floors someday and perhaps finishing the attic. We’ll just add these to our long list! In the early 1990’s we added two suites in our carriage house and then in 1992 purchased the house next door. All three homes are constant upkeep and maintenance including foundation work on both of the other houses, but well worth the preservation efforts. We’ve won several historic preservation awards and continue to welcome our heritage aficionados. We welcome guests to share in our antique filled Victorian home. 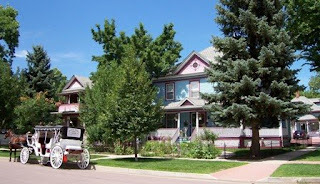 Holden House1902 is named for Mrs. Isabel Holden, the widow of prosperous Colorado Springs businessman Daniel M. Holden. The Holdens owned considerable interests in the Colorado mining towns of Aspen, Cripple Creek, Goldfield, Silverton and Independence for which the five lovely guestrooms are named. Full breakfasts, private baths and historic charm await Holden House guests. Come share a touch of history with us! This entry was posted in bed and breakfast, historical, history, kevin bacon, old house, pikes peak, renovation, restoration by admin. Bookmark the permalink.